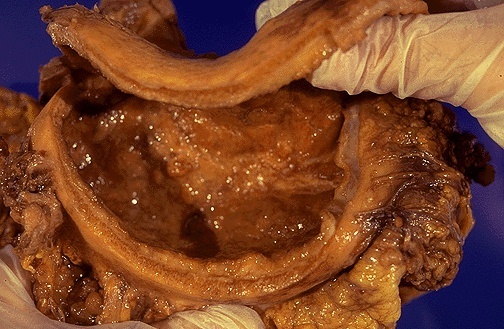 This is an example of linitis plastica, a diffuse infiltrative gastric adenocarcinoma which gives the stomach a shrunken "leather bottle" appearance with extensive mucosal erosion and a markedly thickened gastric wall. This type of carcinoma has a very poor prognosis. 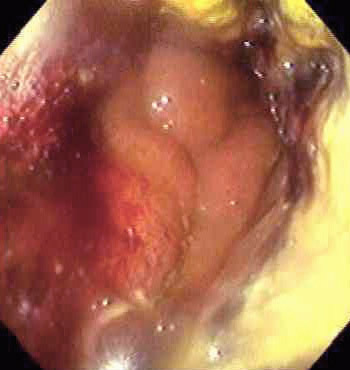 The endoscopic view of this lesion is shown below, with extensive mucosal erosion.